A four day programme of silent films aiming to show exactly what these first films looked like and what the audience were seeing between 1896 and the late 1920s. 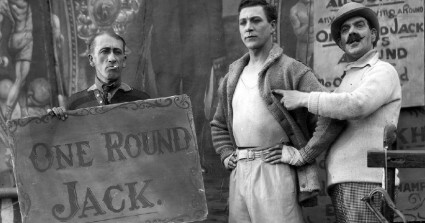 ‘One round’ Jack Sander (Carl Brisson) works in a carnival boxing ring and easily defeats his opponents. He is confident both in his ability to win and in the love of his girl (Lillian Hart-Davies). He befriends Bob Corby (Ian Hunter) a champion boxer who encourages him to take up boxing professionally. Friendship turns to rivalry over the girl and Jack finds himself fighting for everything he holds dear. Hitchcock directs from his own script to produce a film rich in experimentation and visual innovation. Particularly impressive are the montage sequences that appear throughout the film which show Hitchcock’s growing confidence as a director. A DVD screening of three rarely seen titles showing the early fascination of cinema with action, mystery and melodrama. Harry Houdini is a government agent on the trail of a secret society. The film features the silver screen first robot. A Russian melodrama of the relationship between a dancer and an artist. Can anyone capture arch criminal and master of disguise Fantomas? Live musical accompaniment by Stephen Horne who will introduce the screening and answer questions on his experience of composing for silent film. A convict (Uno Henning) escapes from Dartmoor prison and flees across the moors. Inside a nearby cottage, Sally (Nora Baring), is putting her child to bed. She goes downstairs and is confronted by the convict who has broken into the cottage. Through flashback we learn they knew each other before he was imprisoned and a story of spurned love and jealousy unfolds. Asquith creates a simple but beautifully realised tale of sexual jealousy, that easily counters the view that British cinema of the time was theatrical and lacking emotion. Tough steamboat captain Bill Canfield (Ernest Torrence) is facing competition in the town of River Junction. The return of his son (Buster Keaton) fills him with hope, but first impressions of the beret-wearing, ukulele-playing dandy his son has become are not good. Can Buster measure up to the expectation of his father? A great comedy which combines romance, stunts and slapstick. The famous climax during the cyclone that pits Keaton against the elements. Shosho (Anna May Wong) works as a maid in a sophisticated London nightclub. The owner of the nightclub Valentine Wilmot (Jameson Thomas) spots her star potential as a dancer and makes her the toast of the town. Complications arise due to his own obsessions and the jealousy of his former star dancer Mabel (Gilda Grey). One of the true greats of British silent films, Piccadilly still oozes sophistication and captures something of its jazz-age setting. It also features an early appearance by Charles Laughton. An evil sorcerer tricks Prince Achmed into riding a magical flying horse. Carried far from home he falls in love with a beautiful Princess. Helped by Aladdin and a witch he must defeat an army of demons to win her heart. Based on stories from “The Arabian Nights”. Lotte Reiniger was a pioneer of animated film, developing a beautiful delicate and elegant silhouette technique. This was the first feature-length animated film. Life in a quiet village is hard for a farmer (George O’Brien) and his neglected wife (Janet Gaynor). Unknown to her, his head has been turned by the attentions of a woman from the City and they are plotting to drown her. From this simple starting point Murnau creates a film rich in poetry and a sense of fable. One where town and country life is contrasted and the audience is immersed in the fate of these simple characters. Sunrise is the swansong of the silent era and was awarded three Oscars. One for Janet Gaynor for ‘Best Actress’, one to Charles Rosher and Karl Struss for ‘Best Cinematography’ and one for its status as a ‘Unique and Artistic Picture’. This is the only time such an award has been given. Films will be shown on the Electric Palace’s Kalee 35mm projectors and, in the case of some very early films, on a specially installed Gaumont Chrono projector. All films will be projected onto the cinema’s original hand-painted screen. In addition, there will be an exhibition of early cinema technology as well as a display of pre-cinema media. Electric Palace Membership pa available from Box Office, by e-mail, or by writing. £4 adults, £2 seniors & concessions, £1 children under 15; one day membership £1. Normal Box Office hours: Fridays 7.00 pm to 7.45 pm, Saturdays and Sundays 2.00 pm to 2.45 pm and 7.00 pm to 7.45 pm. Box office open additionally from 30mins before each screening /presentation. Only day tickets bookable in advance: by personal application or post payable to Electric Palace (Harwich) Limited, Kings Quay Street, Harwich CO12 3ER enclosing SAE & cheque (must include £1 booking charge). E-mail reservations (boxoffice@electricpalace.com) must be promptly paid for. No phone bookings but e-mail reservations may be made for the 7.30 p.m. shows on the day but tickets must be paid for and collected 30 minutes before otherwise the tickets may be sold. All in all an excellent introduction to silent film for the lucky denizens of Harwich, and hopefully those from a bit further afield. The Electric Palace itself is one of the oldest cinemas in Britain stilloperating as a cinema, having opened in 1911. It still has its silent screen, original projection room and ornamental footage intact. You can read about the history of the cinema here. All details, as usual, from the festival site.